For 2019 our year 3/4 cohort on average, tested lower than previous cohorts. In particular, we have 60+ students working 1.5+ years behind their expected level in literacy. As a team we are focusing on lifting the achievement of students working 1 - 1.5 years behind in reading. 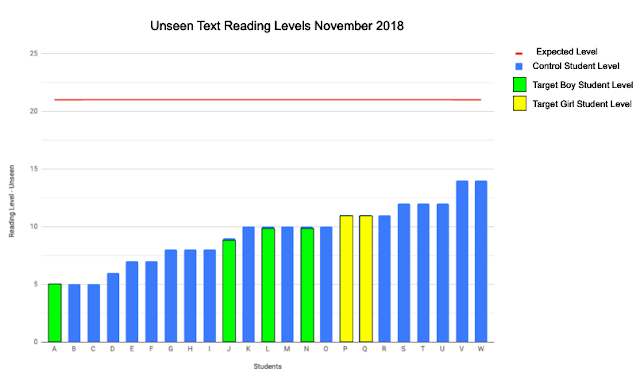 We test the students in June and November using PM Benchmark - unseen texts. The results of 23 of my reading class from November 2018 are below. These students are all working 2+ years behind expected. The challenge that I face is how to lift children in an area of schooling that is essential to all other curriculum learning. Without reading, most students fall way behind in other academic and even social areas. By placing all 28 students in one literacy class, but within a larger MLE - I am able to support the deeper learning needs, but still maintain examples of excellence from higher achieving students within our MLE. My question I am asking is, In our quest for digital initiative, have we lost sight of traditional pedagogies that work for our more vulnerable learners? 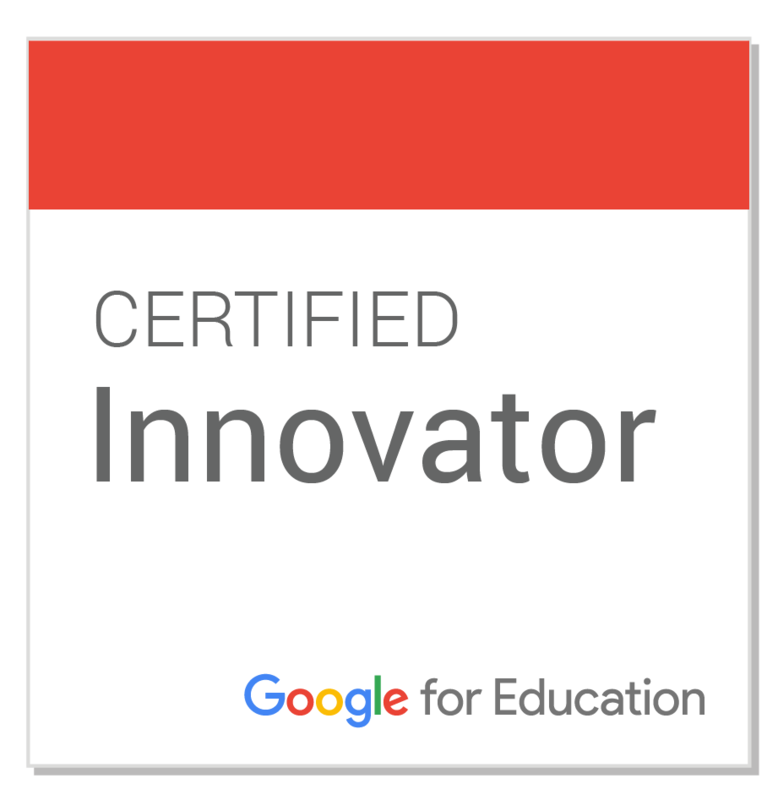 In my 10+ years of being innovative, embracing new technologies and creative approaches, I have seen many of our students thrive across all areas of the curriculum. But how many are missing out? This year, my literacy group are the ones who have missed out. My job is to adjust and adapt our flexible curriculum to provide an onramp to vocab learning, increased confidence, a sense of achievement and improved test results. I am reformatting our bank of Explain Everything resources to support older, lower level students. With a focus on high frequency word learning, sentence structures (surface and deep) and basic comprehension. We are using collaborative engaging technologies to learn to read and spell high frequency words. We are upping reading mileage - through read to, read with and home reading. We are harking back to analogue book work with a focus on taking pride in handwriting and book layout. This may seem superficial, but I truly believe that we have lost many fine motor skills that actually support the students to look for detail in text and self correct errors. These skills are pencil grip, letter formation, using a ruler and visual spatial skills such as layout. As always, I am placing the Key Competencies at the centre of this learning with these students focusing on Self Management and Participation (being successful at school). 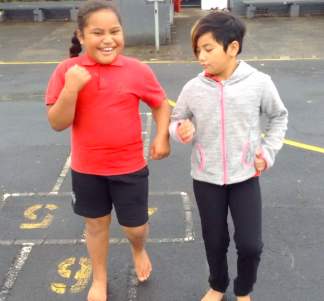 With the Annual Manaiakalani Film Festival fast approaching, we are ready for the just in time check in that our kids are up to speed with Cybersmart blog commenting. 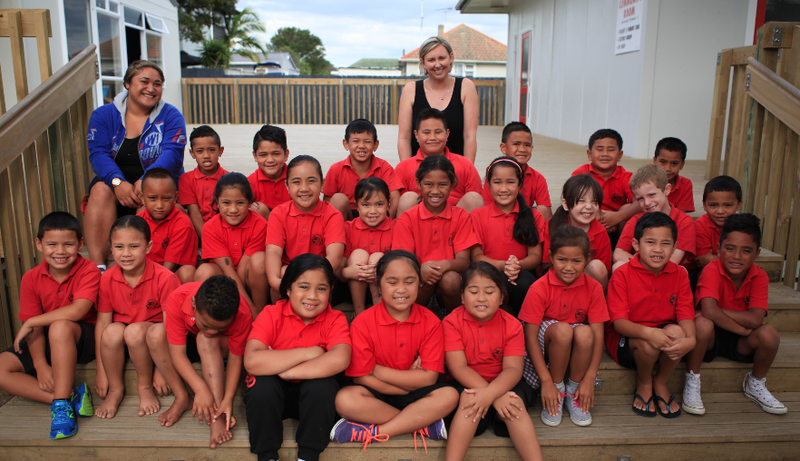 Blog commenting is an integral part of our literacy program but not always directly taught each and every week. 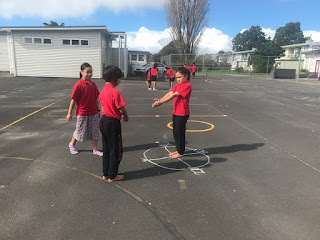 With such a big push this week on blog comments, we wanted to come up with an activity that honed these skills and brought the known blogging kaupapa to the forefront of the kids' minds. We've experienced a lot of success this year using analogue strategies to promote discussion and collaboration. We decided to tackle this challenge creatively using paper, glue and scissors. The children were grouped in friendship groups that would encourage talking and sharing, but also getting the task completed. The task was to watch 4 old Maniakalani Film Festival movies from years past - we purposely chose movies that we knew the children would not have watched - however, we also chose movies that were created by older siblings/cousins - to enhance some connection and engagement. 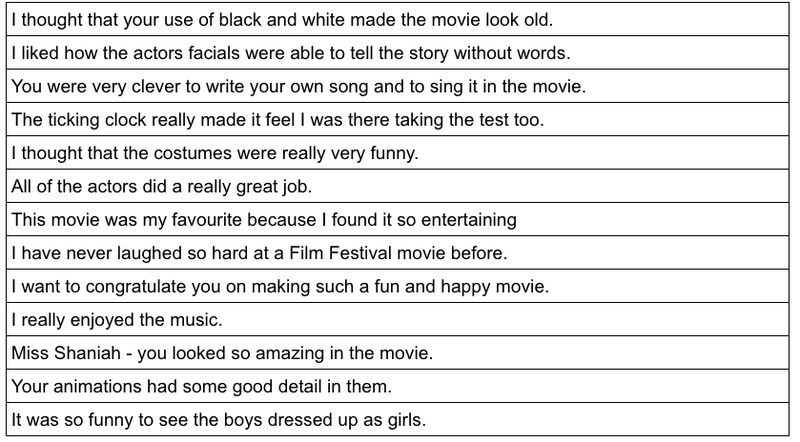 We gave the children pre-crafted sentences that pertained to a particular movie as well as more generic sentences that could match almost any movie. 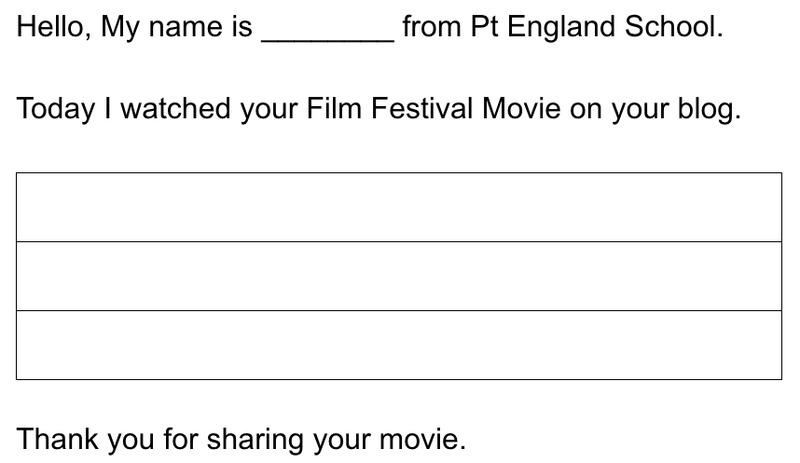 The challenge was to select three sentences that matched each movie to create a comprehensive comment. There was a lot of need for discussion and reasoning as the groups tried to narrow down which sentences were best fit for which movie. Each group then glued their selected sentences onto a template in order to complete their comment. The challenges faced by the children were around actually watching the movies and paying close attention to what set each movie apart and to find matching comments. They also struggled with realising that the movies were "tabbing" within the browser and that they needed to hunt back in previous tabs to find the links of movies still needed to watch. 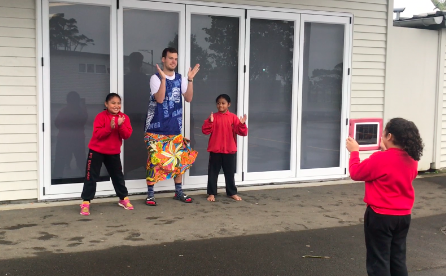 The "reward" for getting the comments completed was to have access to the entire back catalogue of Manaiakalani Movies - an absolute treat as the kids explored literal hours of child generated content. In our 3 class space we switch around learning groups depending on student needs, teacher needs and relationships. Currently I am teaching a group comprising 10 kids who are reading between 1 - 2years behind their chronological age and who are struggling to write complete sentences with sufficient detail. An activity that I have tried in the past introduces the language of words and sentence structure and then encourages the children to play with the words to create different sentences which still hold essentially the same meaning. 10 years ago, PLD with Jannie van Hees introduced me to English grammar (despite 13years of schooling in NZ) and the importance of explicitly teaching grammar to ESOL students to enhance understanding of how words can be put together to create powerful sentences. I made word packs with verbs, adjectives and adverbs - individually laminated and colour coded. Added to this are a small set of prepositions and blank cards for writing nouns. To start with I'd give each group individually selected words that would make sentences - simply. The idea was to have the children be successful in putting the words together. Once the sentences were put together, we discussed the role of each word in the sentence and the power that they hold. We spoke about verbs and how adverbs come in to play to modify the verb or to add more detail which gives the audience a greater understanding. We talked about nouns and how adjectives play a role in adding detail. We also looked at how prepositions can be used to add further context to a sentence. We played around with the order of the words and looked at how a sentence can still share the same message and use the same words - even if put in a different order. The most powerful part of this activity is listening to the groups discuss and work through each set of words as they attempt to make the most detailed and powerful sentence. They argue with each other, back themselves and yet still listen when faced with a different point of view. We found that on most occasions, once the sentence is said out loud, the children were very quickly able to ascertain the validity of what they had constructed. There is always great enjoyment in this particular activity and as we become more practiced at the grammar and structure, we are starting to choose the words blindly from the packs and are taking the opportunity to learn new vocabulary. We noticed in our cohort this year that most of the children struggled to use scissors, use glue "sparingly" and have those constructive learning conversations with their peers. Using a device meant that we could complete these sorts of "cut and paste" activities with less mess and less fuss, but the children were missing the vital fine motor skills and the art of argumentation and justification. We hypothesised that by having the activity printed and in hard copy in front of the group, we would illicit argumentative discussions that would encourage the children to justify their points of view more readily and more strongly. We set the context around punctuation as this was the main area in our E-Asttle testing that was letting this group down. Our groups were friendship based in the hope to encourage the conversation. The task involved scissors, glue, crayons and lots of talk. Initial excitement was high as we explained the activity to the class. 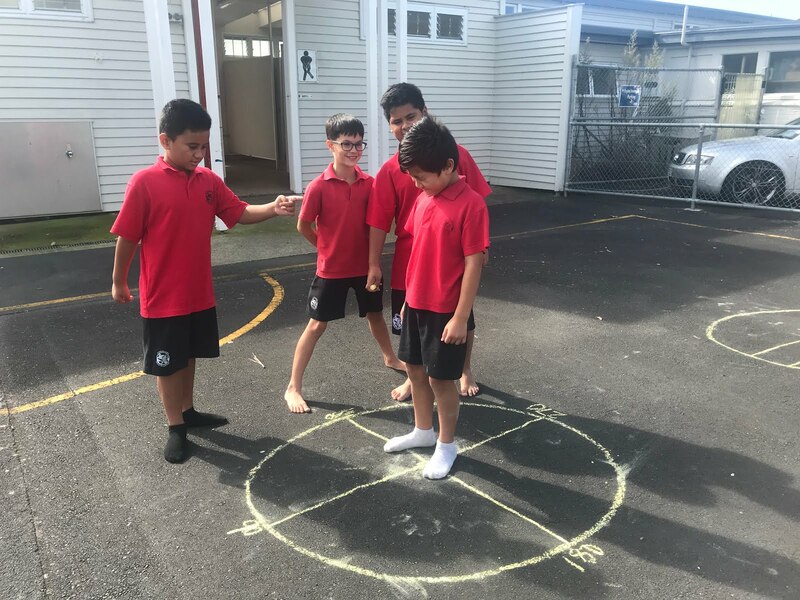 They were excited to work with friends and excited to rotate round different activities, to complete a variety of tasks. We were fortunate to have a third year student teacher in class, which meant that we could have slightly smaller group sizes at each station which made some of the management slightly easier. Organising sentences into simple and complex sentences. Constructing complex sentences from dependent and independent clauses. Each group had to work together, justify and explain before cutting, pasting and taking a photo to insert onto their Google slides. We noticed as we introduced our activity and supported the kids through the learning, that while not all the children completely grasped the concept being taught- every child embraced the idea of team work and discussion. The students who lacked the initial knowledge, thrived on listening to their peers and offering input when they felt confident. The students who went into the activity with more confidence, learnt to assist their friends and to listen to others points of view and to build new knowledge of their own. This discussion and listening built well on what we have been practicing during DMiC this year. The fine motor skills were definitely challenged with many groups cutting through work instead of neatly around it, too much glue being used and not being able to glue papers to fit in correct spaces. 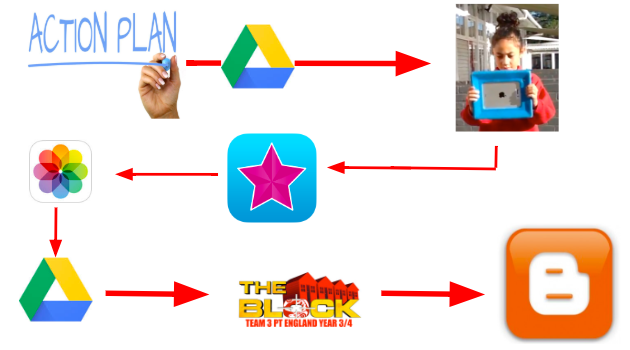 However each student could use an iPad effectively to take photos and upload their work to the right folder. I'm not sure we should be sacrificing one skill for another - so more work to be done on the more analogue tasks. 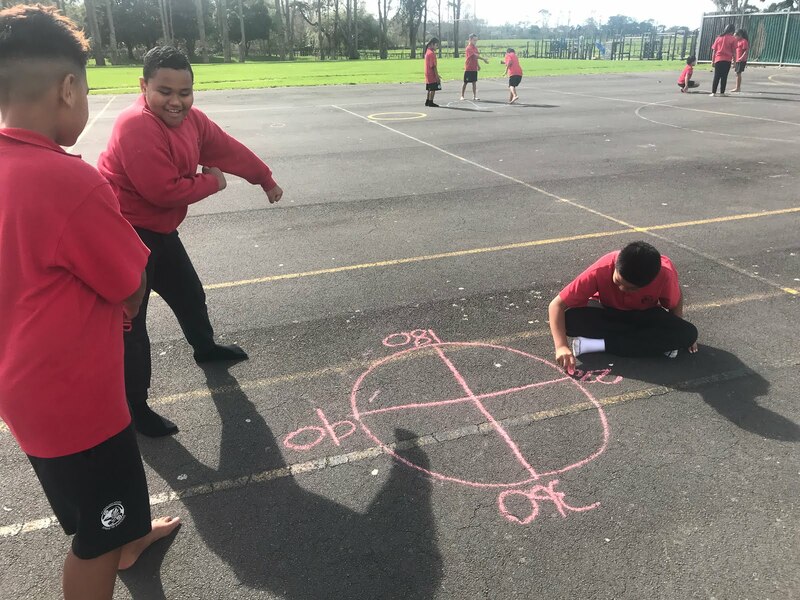 The children loved being more active in their learning and the classroom was a buzz with that fine line between chaos and lively discussion. As teachers, we enjoyed listening to the children talk and argue, as well as problem solve and work through issues and differing points of view. We endeavour to do an activity such as this involving groups, discussion and analogue processes at least once a week. We owe our kids the best of both worlds to ensure they develop a range of essential learning tools. The new digital technologies curriculum is not simply about screens and being digital. One of the strands - computational thinking, can be tackled in a very analogue fashion. In DaBlock this term, a group of 30 year 4s and 1 year 3 are learning all about coding using Scratch. We started the session signing into our classroom group and creating some simple avatars. We then began looking at the blocks and using them to control the cat sprite using our mouse and arrow keys. Some students even went ahead to learn about costumes and costume changes. Great self directed learning. The next step was to introduce angles and turns. None of the students had heard about angles, degrees or knew much difference between left or right. A quick whiteboard lesson introducing the missing pieces and a quick game of Simon Says involving angle turns and degree turns, quickly filled in some missing gaps. We then took chalk outside to draw their own circles and label the degrees, where the children then played their own Simon Says games with their friends. 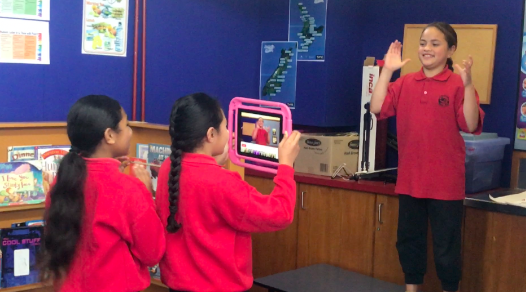 Once the kids were back inside with their Chromebooks, Scratch angle turns made sense and heaps of quick knowledge learning could be applied to some fun animations.